The Colgate Connect E1 is a smart electric toothbrush that aims to use Artificial Intelligence to improve your brushing habits. However, whilst the brush works, the unreliable app and other annoyances are showstoppers at present. The E1 is not representative of Colgate’s usual high standards. Conceptually this brush is the future, but sadly in practice it is a step back. If you are short of time, the answers to the following 3 questions should let you know all you need to about the Colgate Connect E1 toothbrush. If you want more detail, you can read our full Colgate Connect E1 review further down the page. The fundamental cleaning parts of the toothbrush work, so you can clean the teeth with it. Sadly, the key reason to buy this brush is for the smart features, which I have found to be extremely unreliable. This reliability and associated annoyances detract from the overall user experience. Much of it is likely software, that can be updated, but at the moment you can get a better toothbrush for the money. 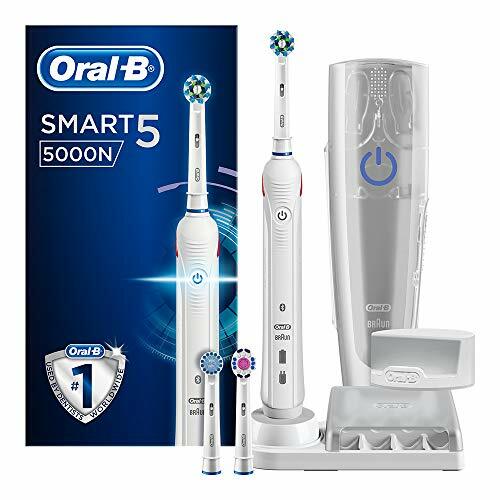 Assuming that the ‘smart’ features are what you are after, then the Oral-B Smart 5 5000 would be my recommendation as an alternative. There is the Kolibree Ara (on which this brush is based – more in the variants section) as well as Philips Sonicare’s FlexCare Platinum Connected, but with price and features in mind, the Oral-B Smart 5 5000 is the better choice. Oral-B’s app does lack a games mode for kids and the ability to have different user profiles which are two appealing features of the E1. For even more options, see our post looking at the top rated brushes for 2019. 3. Where is the best place to buy the Colgate Connect E1? At the time of writing the E1 can only be purchased from Apple stores or via Apple’s website. It is not possible to buy it from the usual stores you would expect to find electric toothbrushes. Amazon, Asda, Tesco, Sainsbury’s, Boots etc do not sell it. Colgate are a well known brand within the dental health space and a long time manufacturer of electric toothbrushes, we really like the ProClical Pocket-Pro and 250+. So called ‘smart toothbrushes’ have been made by Oral-B and Philips Sonicare for a couple of years now, the Genius 9000 and DiamondClean Smart are just 2 examples. Therefore it could be argued that Colgate are behind in their offering, given that the E1 was launched in 2018. However, Bluetooth and the accompanying applications that make these brushes ‘smart’ are typically not the first thing users ask for, so perhaps Colgate were right to wait. Even now, the E1 is made in collaboration with Kolibree, rather than being an all out Colgate produced product, so tentative steps by Colgate. Technically, there is only 1 Colgate Connect E1 Smart toothbrush. Colgate do not produce versions in different colours, with different box contents or features, at the time of writing at least. However, the E1 is made in partnership with Kolibree. In fact, on the brush handle and the box, you will see the logo and the words ‘powered by Kolibree’. Kolibree are a French company who have a history of producing smart electric toothbrushes. The Colgate Connect E1 is essentially a rebadged version of their own Ara, which I reviewed here. The Ara is a different colour (Blue), has 1 less brush head in the box and is more expensive than the E1 from Colgate. Therefore, of the 2 models, the Colgate Connect is the brush to go for. Here are what I consider to be the pros and cons of the Colgate E1. 1 cleaning mode – Simple, easy to use and no nonsense for getting the job done. No added complication of additional modes. Small brush head – Brush head is small and can be easily moved around the mouth. Battery life – Up to 2 weeks of battery life, a little longer than the claimed 10 days. Design – Slim and light in hand. App interactivity – The built in game for kids, helps encourage them to brush by having fun whilst doing so. App user profiles – The ability to setup more than 1 user in an app for better tracking, ideal for families. Bluetooth/App – The application is buggy and the brush often struggles to connect, really hampering what is a key feature of the brush. No pressure sensor – There is no pressure sensor built in to stop adults or children alike from brushing harder than they need to. Design – The gloss plastic is a touch slippy and a grip on the back would be nice. Brush heads/availability – Limited availability making it difficult to get hold of. Travel case/storage – No accessories included or sold separately to encourage family use. Brush head caps function, but not the best option. First glance at the Colgate Connect E1 and it has the hallmarks of a Colgate electric toothbrush, most notably the big Red and White Colgate logo that contrasts against the gloss white body of the the brush. Some might argue that the brush looks a little clinical, I would tend to agree. There are no funky colour options to make this a bit more personal and appealing. Slim and lightweight, the handle of the E1 is smooth to the touch with no raised plastic nodules or rubber attachments to help with grip. Whilst this isn’t going to just slide out of the hand, it can be a little slippy when wet and if used by children, it may unintentionally get dropped from time to time. The brush handle is more square in design than many of the rounder Colgate models, but there are no rough edges as the normal corners have been rounded off. Looking at the brush face on the most dominant element is the logo running up the brush handle. Towards the top of the brush handle, before you get to the detachable brush head are 2 important elements. There is the power button and the charging LED. The LED sits below the round power button, and the shaping of the LED is very much like a cat’s eye, a long elliptical shape. It lights up when the brush is on the charging stand or in use. Green: the battery is charged. Yellow: the battery’s charge level is between 50% and 10%. Red: the battery’s charge level is low (below 10%). 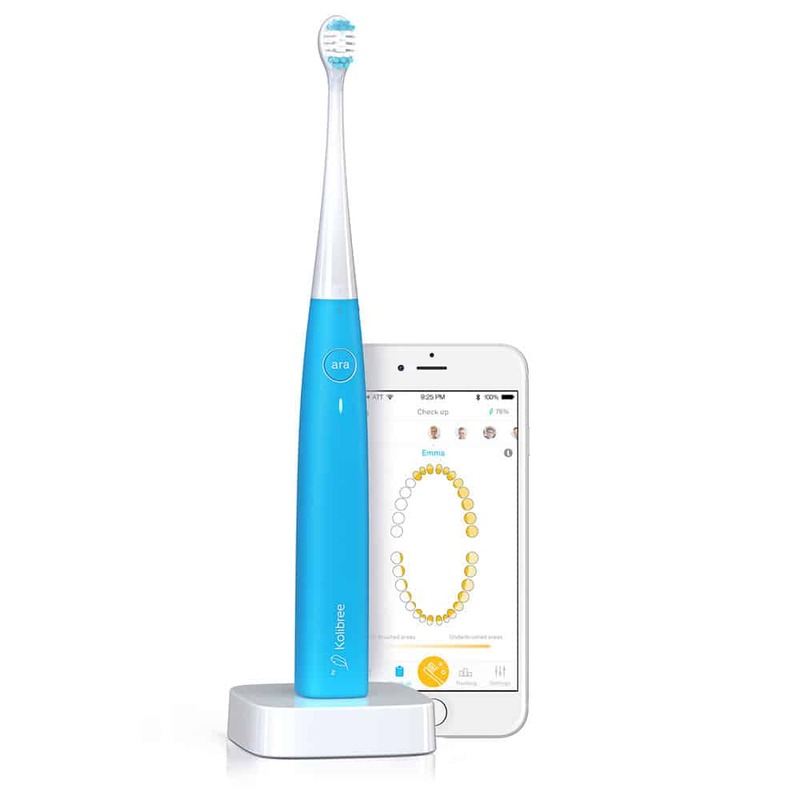 Flashing blue: the toothbrush is connecting via Bluetooth. Just 1 quick press of the power button turns the brush on, whilst another turns it off, or more technically speaking puts it into what is known as standby mode. You need to hold it for a full 8 seconds to turn the brush off completely. A grey power icon is printed onto the button, to make clear its function. Although there is a clicking sound made by the button it does not give quite the same level of reassuring feedback that some other power buttons do. The side and back of the brush handle are all smooth touch plastic with nothing to speak of, other than the ‘powered by Kolibree’ logo that sits at the back of the brush handle. At the very top of the brush handle, where the brush head connects are a couple of printed icons, these are to help demonstrate and show alignment for the user replaceable brush head. With most electric toothbrushes, the removable heads pull off and push on. Here, with the Colgate E1, they are pushed on, but have to be twisted to lock in and out of place. It is a twisting motion of about 45 degrees. The brush comes pre-fitted with a head. Therefore, assuming you are looking at the brush head on, you twist the neck of the brush head about 45 degrees to the right to unlock it, then pull the head off. You will notice the movement will line up with the printed icons on the handle/head. To fit a replacement head, pop the new head on to the handle with the bristles facing about 45 degrees to the right. Twist 45 degrees to the left and it will lock into place. It makes more sense when you see and do it and the head can only be fitted one way. Each brush head is designed to last a user approximately 3 months before it is to be replaced. In the box are 2 brush heads. If you are the only user of the brush, then this will mean you have heads to last you 6 months. You may notice 1 brush head has pale blue and white bristles, whilst the other has dark blue and white bristles. There is nothing different between these heads other than the bristle colour. This is purely to help you know which head is yours if you were sharing the brush handle with another user. Please note too, that the heads supplied with the E1 are specifically for the E1 and the brush heads for other Colgate models do not fit! Place the brush on a flat worktop and it will stand upright. It will lay quite comfortably on its back too, not rolling around, thanks to the slightly squared design. If you lift the brush handle up and take a look at the bottom, you will find a recess in the base. Into this recess fits the prong on the charging stand that comes in the box. Built into the battery is a rechargeable battery, which is quoted to last about 10 days. Based on 1 user brushing for 2 minutes twice a day, expect to have to place the brush on the charging stand every 10 days or so. That said, you can leave it on the charging stand when not in use if you prefer. When in actual use, the cleaning capability of this brush is ok. It is much more effective than a manual brush in my opinion and pretty much equivalent to any Oral-B or Sonicare. My day to day brush is Oral-B. This sounds a bit strange, but it gives what I would describe as a more powerful and aggressive clean. I always feel that my mouth is fresh and clean post use. Producing a strong vibration, a little too much of which is ‘lost’ in the brush handle itself, the bristles move rapidly over the teeth. It is much more similar to the way Sonicare brushes work and feels a touch weaker than Oral-B. Whilst I have not conducted any clinical trials to see how they compare, I had no immediate cause for concern and expect results would show them all to be fairly similar. The brush head itself is not round like Oral-B’s brush heads, it is relatively small and is not as large as Sonicare’s heads. I quite like the size, it was easy to move around the mouth and along the teeth and gumline. You are unable to adjust the power of the E1 like you can with some other electric toothbrushes. There are no intensity settings and there is just the 1 cleaning mode on the brush. This cleaning mode uses the full power of the brush motor and runs for as long as you let it. There is a 2 minute timer and pacer built into the brush handle. Dentists recommend brushing your teeth for 2 minutes twice a day. If you break your teeth up into 4 sections, upper right, upper left, lower right and lower left, you spend 30 seconds cleaning each area of the mouth. What the brush will do is pause very briefly at 30 second intervals to alert you. You hear a change in the sound and change in cleaning motion, so you know to move the brush head to a different section of the mouth. After 2 minutes, the brush does not automatically power off as is case with most other Colgate models, it carries on going, but you do get a different pattern of pauses in the brush motor so it is clear that 2 minutes have passed. That said, if you are using it with the app at the same time, as intended, it will automatically power off. Such a timer and pacer is essential in my eyes. Unlike Oral-B and Sonicare that offer a range of brush heads, Colgate offer just 1 style. Replacement packs include 3 brush heads and should be around £15-20 per pack. I say should, because at time of review, although you can buy the brush, you can’t buy Colgate branded replacement heads. I understand, that you have 2 heads in the box, but not being able to buy spares at launch is far from ideal, particularly when this is suggested suitable for families. 1 option is to go to Kolibree’s website and buy their heads, which work. Seems a bit ridiculous, but a solution. There are no fading indicator bristles on the brush head or reminders in the app to tell you when you should ideally replace the head. Therefore it is up to you to remember how long ago you replaced the head. Small oversights like this in my opinion make what could be a smart brush, not so smart. So as electric toothbrushes go, it has most of the basics covered and does a good job. However, this is no different to other Colgate models. What makes the Connect E1 special is the smart technology built in. Unlike most other electric toothbrushes, the brush has Bluetooth 4.0 and a supporting application available in both the iTunes App store and Google Play store. At the time of writing, although the brush can be purchased only from Apple, it can be used with Apple iOS and Google Android mobile devices. The idea and how you should get most value from the brush, is to use it in conjunction with the app. The principle behind the app and the connectivity is that sensors in the brush handle and the application itself work together to understand how you brush. This data is interpreted and AI then compiles this in a way to help educate you and make you brush better. Ultimately, within a few weeks of use, you should get better and perfect your tooth brushing technique so that you are less likely to get dental health issues such as gum disease. The app is not a replacement for your dental visits, but is a tool to help you do better when not being checked by a dental professional. Ultimately you can think of the smart features as being like having a dentist on call to monitor and help you improve. Initial setup and configuration of the app and user profiles is fairly straightforward. No real complaints here, thanks to nice explanations and tutorials within the app. Whilst suitable for adults and kids alike, one of the selling points is for parents to monitor their children’s brushing habits as interactive game content is provided and supposed to increase the brushing time and make teeth cleaning fun. Go Pirate is the game that is installed and played as they brush. The child essentially plays the character of a pirate and are led on a treasure hunt. Moving between islands, in search of the Great Black Beard’s treasure, there are some 16 levels to the game. The toothbrush interacts with the game like a joystick, with the full intention of the game being played whilst brushing their teeth. During their brushing, children collect gold coins, which allows them to acquire boats and to access different islands. Move the brush to the right side of the mouth and the pirate moves to the right, move the brush to the left and the pirate moves to the left. The movement and coin collection work hand in hand with the area of the mouth that should be brushed. It works well and the sensors in the brush really can tell the position. When children brush properly and regularly, they earn more coins which allows to progress in the game. The game is designed to last for at least 3 months, with two brushings per day for two minutes minimum each. A quick warning, if you hadn’t already thought of this. It is likely the app will be on your (parents) smartphone. The child needs the phone to use the app when brushing. Smartphones, kids, water and bathrooms. Typically not a recipe for success. You decide the risk! Given some of the child focus, a stand in the box for a smartphone would be nice. Is this the best toothbrush for children? I don’t think so, but it is a very good attempt and can certainly work in a family environment as there is a more conventional timer setup for adults. A nice touch with this setup not successfully done by any others at this time, is that it offers different user profiles. This means that the brush handle (not the heads) can be shared amongst different users and the data relevant to that person saved in the app, under the correct profile. You must select the appropriate profile before commencing brushing for it to log the data for the correct user. As an adult, when in use, you get a more conventional on screen timer/mouth map for lack of a better phrase. Power the brush on and the app will detect the brush is running and begin showing you which area to brush. Thanks to sensors icons on screen turn green or red to highlight correct or incorrect brushing technique. Clear visuals show you when to move the brush to a different section of the mouth and post clean you get a score. It gives you data like how much of the tooth surface area you cleaned and how long you brushed for. Visuals show you what areas of the teeth you did and didn’t clean. So, for example, if you got a score of 60%, you could see what 40% of the tooth surface you missed. The more times you use the brush, the more data it collects. The idea is you learn and improve and all your averages such as duration, surface coverage and frequency improve. Because it is not always practical or you may simply forget to have your smartphone with you when in the bathroom, the brush will retain brushing data and sync it to the app next time it is within range/connected. You need to do this at least once a week otherwise the data will be lost. Overall the app has a nice layout and is fairly intuitive to use, but there are some big issues that pretty much act as a roadblock to using this in the way it was intended. Ultimately it comes down to the app and connectivity being buggy and unreliable. I had the same issue with the Kolibree Ara when I reviewed that last year. The app has been updated, but still lots of issues. Firstly, the brush connectivity is so intermittent. There appears to be no pattern as to if and when the brush will connect. I have spent more time trying to get the brush to connect than I have actually brushing with it, or at least that is the way it feels. There are different user profiles, but it tends to default back to the ‘master’ profile, because that is the profile the brush was first connected to. I for example had my own profile ‘Jon’ and a ‘Test’ profile. Even though I selected ‘Test’ profile, before brushing, as instructed, at the end of the cleaning, I was asked would I like to save it to the ‘Jon’ profile or the ‘Test’ profile I was in. This is good I guess, but just a bit of a pain as you select the profile ahead of time. I don’t recall it asking me, when in the ‘Jon’ profile, would I like to save to ‘Test’. From several weeks of trying to use it, although there are profiles, it feels like the idea is you should really have 1 different brush per user, rather than sharing a brush handle. I did not want to buy another brush just to try this and see if it was any better, it seemed pointless, particularly as a selling point of this brush is the profiles for family members. The 30 second pacer built into the brush does not tie in with the app. Where normally, you would spend 30 seconds focusing on each quadrant, if you follow the coach/graphics on the app, it will have you move from top to bottom teeth, from left to right side in approximately 5-8 second intervals, giving 16 sections in total. Whilst these 16 sections amount to a total cleaning time of 2 minutes, it does not work on the quadrant basis like most other brushes do. This therefore makes the 30 second pacing a bit silly and pointless. As I understand it, there is no way to turn the 30 second pacer off or change the way the graphic works. Even if you ignore the graphics and stick to the quadrant approach you might know, I believe the app will incorrectly report your brushing accuracy, because you haven’t followed the directions. For me, using the Colgate Connect E1 means essentially relearning my brushing technique. Whilst there is no need for you to need or do this, because you only cheat yourself, during my testing, I found that if I powered the brush on, left it stood upright for 2 minutes, whilst connected to the app, I achieved over a 50% surface coverage, despite not having moved the brush out of the upright position. At no point did the brush angle at 45 degrees to my gumline. I appreciate the sensors and tech cannot be perfect and are only ever a guide, but this is in my opinion is extremely inaccurate and has me questioning just how accurate the sensors really are. For Apple users this is supposed to feed into Health Kit. Whilst I did not test on an iPhone I suspect the reliability issues may still exist. Although you don’t need to have the app with you when you use the brush, when the brush re-syncs with the app, I understand all the previously unlogged data to go straight to the master profile. So if different users have used it within that time, it is not possible to log it to the correct profile. A little nugget of positivity to take from all of the negatives is that when it is connected to the brush, the app actually shows a percentage (%) remaining for the battery, something I have not seen from the Oral-B or Sonicare apps. That then is the app and ‘Smart’ element of the brush. To wrap this section up, I will add that in the box comes a small plastic travel cap for each brush head. This will protect the bristles only when in transit. There is no travel case provided or sold separately. This would be a nice accessory to have and make it more appealing for regular travellers. Given that this brush is designed to educate about better brushing techniques, the addition of a pressure sensor would have been nice, but sadly it was not included. All too often people brush with too much force, damaging the gums, teeth surface and wearing out toothbrush heads. Most Oral-B and newer Sonicare models offer this. As this is too geared, by my impression anyway for families, more brush heads or storage accessories would be a nice touch. Brush turns off automatically when used with the app, continues when not connected. The battery life is the amount of time the brush can be used between a full charge and the battery cutting out and working no longer before a recharge is required. Whilst every brush is different, as a general rule today I would say the average battery life is 2 weeks (14 days) based on 1 user. 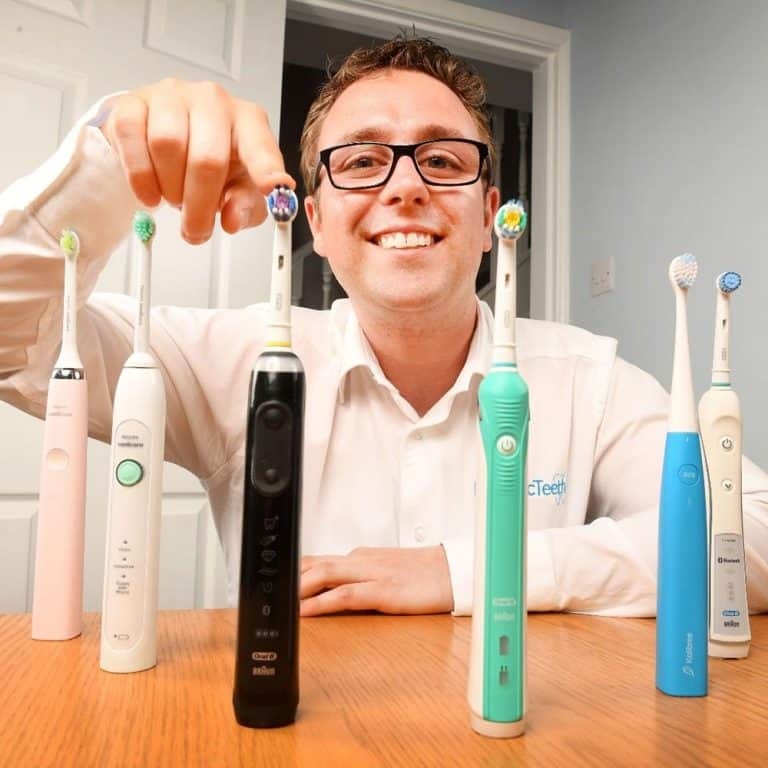 Sonicare have led the way with brushes that offer 3 weeks, with Oral-B tending to be nearer 7 days. Oral-B have been catching up in the last year or so, upping that average to about 10-14 days. Colgate have for the last few years always remained fairly steady offering a very respectable 2 weeks or so battery life. The Connect E1 can achieve 2 weeks (14 days) as my hands on testing confirmed, but officially it is 10 days of battery life. This is actually a little on the low side considering some of Colgate’s own cheaper brushes. The Bluetooth has a very small bearing, but it sad to see that 14 days is at a stretch rather than all the time. 10 days between charges is based on 1 user brushing twice a day for 2 minutes. Essentially that is 40 minutes of running time. It is not the worst, but below what I had expected and really gives the E1 yet another challenge when comparing it to other similar brushes. The battery is built into the brush and is not user replaceable, it is fixed inside the handle. It is not necessary to leave it on the supplied charging stand in between uses, but you might want to, in order to keep the battery topped up. This is more necessary if you share the brush with other users, as that battery life will be depleted even quicker. The charging stand itself is fairly chunky, not thick, more wider and deeper, much bigger than the stands from competing brands and even Colgate themselves, but don’t forget this is a Kolibree brush at heart. A 2 pin power adapter is supplied, suitable for UK bathrooms. If you do not have a 2 pin socket, you can purchase an adapter so it can be connected to the 3 pin UK mains power supply. White in colour the stand works on 100-240v which is great as it allow and is suitable for international travel, no voltage converters necessary, but a power adapter will be. The charging dock itself has a small prong on the top which aligns with a recess in the bottom of the brush handle and will charge the brush fully in about 8-12 hours. If left on the charging stand most of the time the battery will always be topped up, but the LED on the brush handle and the app will to give more information on the remaining battery power. When connected, the app will show a percentage (%). The LED will on the other hand be lit green if the battery is charged. Yellow means the battery’s charge level is between 50% and 10% and if it is red, the charge level is low (below 10%). Fixed internal battery, not user replaceable. As at the time of writing the Connect E1 is sold only through Apple stores and website, the price is somewhat controlled and not subject to the big discounts that is often the case with similar products. At £90 this brush is actually priced a little more competitively than I first imagined. I thought it would be over the £100 price point. The competing brushes from Oral-B and Sonicare tend to have much high retail prices and sell at similar rates to the Connect E1, but I like the fact that the E1 is more sensibly priced out the gate as it were. Kudos to Colgate. However, when you start comparing the specs on paper, Oral-B brushes are much better value as they tend to offer better box contents and additional features, such as a pressure sensor. Sonicare’s models do tend to be a touch more expensive, but quality you do get. If the E1 functioned as it should I would say this price overall was pretty fair given what it offers, but ideally it would be £10-20 cheaper to be a really compelling purchase. Very often Oral-B’s flagship model the Genius 9000 is in the low £100’s and would arguably be a much better investment. Brush heads are a touch more expensive too at £15-20 per pack, making each head anywhere between £5-6.60 each. Sonicare can be around this price, but Oral-B tend to be under £5 per head most of the time. Price and what you pay is of course personal in that what one feels is good value another may not. At Electric Teeth we work out the cost over a 3 year period as we believe from our research that this is roughly speaking the average time people will keep a brush for. Keep it for longer and you get only better value. The E1 costs £90 to buy. 2 brush heads are supplied, so a further 10 are required over 3 years. At a approximately £6 per head you are looking at an additional £60 over 3 years. The total then becomes £150 (£90+£60). Over 3 years this works out at a daily cost of 14p. Extra value can be gotten by sharing the brush handle, but extra heads will be required. The more users per handle, the greater the value will drop. For sake of comparison, Oral-B’s Smart 5 5000 is just 11p per day and a total cost of £119. Ideally I would use this brush day in day out for weeks on end to say how well it really fares. However, there is only so many toothbrushes a man can test at 1 time. Having tried so many, I do my best to find any weak points in the brush and any places it may fail. I have used it for a few weeks and on the brush has functioned fine, without issue. The app reliability and performance is another matter. I do not believe the brush itself should have any issue lasting for many years. For peace of mind it does come with a 2 year warranty. Whilst Colgate are a well known brand, I have always felt that their toothbrushes have been overshadowed by the Oral-B and Sonicare brushes. 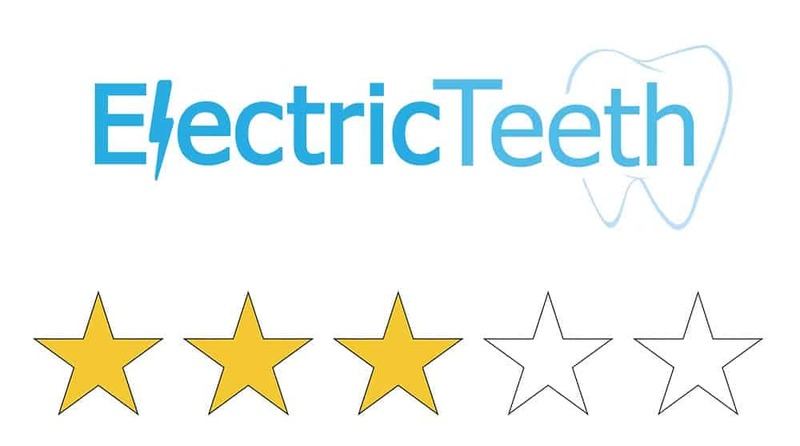 Commercial focus may be different, but as a company they deserve more attention for their very good value, strong performing electric toothbrushes. Sadly, the Colgate Connect E1 Smart toothbrush does not live up to the same standards. I am all for pushing toothbrushing tech forward and helping the nation brush better, but whilst the brush works the unreliable app and annoyances are showstoppers at present. The E1 is not representative of the standards I would expect of Colgate. Conceptually this is the future, sadly in practice this is a step back. Much of what I feel is lacking I do believe can be resolved with a bit of extra work on the software, it really will not take all that much. But, time it will take and currently this is not a product I would encourage you to buy. Instead, spend your money on the Oral-B Smart 5 5000. It offers a better value package and is a strong all round performer. Is the Colgate Connect E1 an oscillating brush? How many brushing modes does the Colgate Connect E1 have? This brush offers 1 cleaning mode, which is the standard ‘Clean’. Press the power button to switch the brush on, then again to be taken to switch it off. Does the Colgate Connect E1 have a pressure sensor? Does the Colgate Connect E1 have Bluetooth? Does the Ara come with a warranty & how long is it? Does the Colgate Connect E1 connected toothbrush have a built in timer? Yes. It has a 30 second quadpacer and 2 minute timer, when not connected to the app. At 30 second intervals a slight pause in the brushing mode to tell you to change quadrant. There are 4 quadrants to the mouth. At the end of the 120 seconds 3 consecutive quick pauses will signal the end of the clean. The battery lasts up to 40 minutes, which is equivalent to 10 days of usage based on 2 x 2 minute cleans per day. Yes, a charging station is included. Can I use the Colgate Connect E1 in the shower? The brush is water resistant and designed to withstand exposure to water but the prolonged exposure to water in a shower is not ideal for the brush and is strongly advised against. Do you own or have you used the Colgate Connect E1?